An educator will visit the school and offer a lecture about topics like marine and coastal ecosystems, endangered marine species, and climate change, among others. The lecture is approximately 45 minutes long. 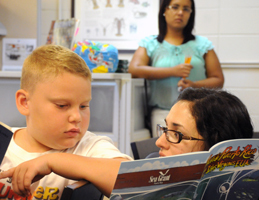 In each visit, our educator can work with a maximum of two (2) groups. The groups cannot surpass 30 students, and must be accompanied by a teacher. The chats must be requested a month in advance. During the course of this activity, participants get to know the marine ecosystems (mangrove, seagrass and coral reefs) and the organisms associated with them by going on a field trip. Laboratory experiences are included. Students perform simple tasks related to marine and coastal resources. They can also observe marine organisms and other ecosystem elements in several stations prepared just for them. While participating in this activity, students will have the chance of using many of the different activities marine scientists employ. They will practice simple scientific techniques for taking samples and analyzing them in a laboratory. This activity is two-fold. First, students will enjoy a field trip, in which they will see and get an orientation on marine ecosystems (mangrove, seagrass and coral reefs) and the organisms associated with them. 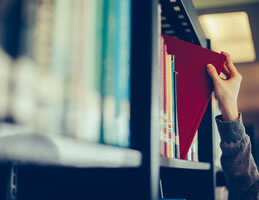 Then, they choose a literary genre, such as essay, poetry, and short story, and write about topics related to the day’s discussions and discoveries. This activity is two-fold. 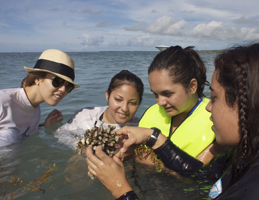 First, students will enjoy a field trip, in which they will see and get an orientation on marine ecosystems (mangrove, seagrass and coral reefs) and the organisms associated with them. Then, they spend the second half of the workshop producing written material like songs, stories, and plays, on the themes and topics discussed and discovered. This workshop will take participants on a field trip to the Tres Palmas Marine Reserve in Rincón, and explore the ecosystems therein. 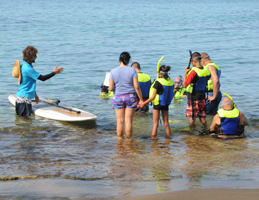 The workshop includes chats, a walking tour of the beach, and a snorkeling activity. This workshop is only offered from May through August. 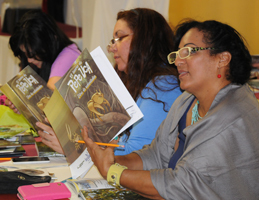 Our staff uses this workshop to orient and capacitate teachers on the proper use of our marine ecosystem educational guides. 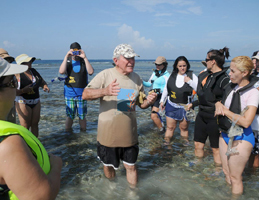 The workshop includes two field trips through which teachers get the chance to see the ecosystems up close and thus increase their scientific knowledge of them. The teachers are presented with demonstrations on how to integrate technology and the library into the classroom. This workshop capacitates the participants in all the activities involved in the Sandwatch Project. 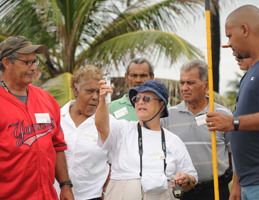 Participants go on a field trip and use scientific instruments to take measurements on different aspects of the beach. Then, they are oriented on how to properly analyze the gathered data. At the end, the participants should be prepared to give students and community members and take them on field research work. Depending on the quantity of application forms we receive, this workshop is offered twice a year. 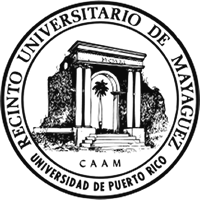 The goal of this workshop is to orient the participants on the use of peer-reviewed search engines, like the databases selected by the University to supplement the undergraduate and graduate course curricula. This workshop instructs students in the intermediate and secondary levels on how to successfully search for information in the library, and given them a chance to become familiarized with the classification systems, ordering books on the shelves, and finding information in print books. This workshop is offered to librarian schoolteachers from K-12. Here, they will be shown the services and resources that UPR Sea Grant offers the school community through the MEIRC. 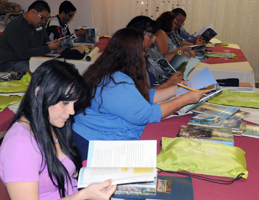 The workshops involving field trips and meals have a $30.00 cover fee per person. 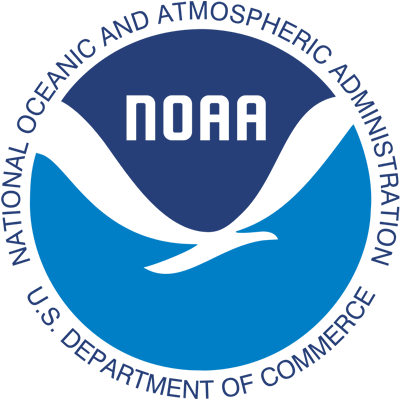 The Sea Grant Program uses this cover to pay its employees, the materials offered to the participants, and the equipment used that day. All workshops must be requested and applied for at least two months in advance. Furthermore, the workshops might have additional costs depending on the materials offered, the amount of time they take (there are workshops for teachers that are residential), the meals provided, and the field trips undertaken, since we strive to adapt our offers to the participants’ and collaborators’ needs. The group’s needs are individually considered and there is a chance that during the course of the year, workshops not included in this list are offered. 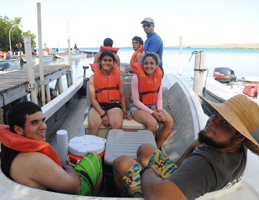 The majority of our field trips take place in La Parguera, Lajas, except for the Tres Palmas Marine Reserve workshop, theSandwatch Project workshops (which might take place in various locations), and other workshops that groups with specific needs might request (Vieques or Culebra). For safety reasons, if the weather is considered unsuitable, the field trips may be canceled. To obtain more information and arrange chats, workshops, or have Sea Grant offer their participation in educational fairs, please call (787) 834-4726 and/or send an e-mail to comunicacionespsgupr@gmail.com.